Thanks so much to you and Deb for setting up yesterday's golf outing. I really appreciate how hard you work to provide unique business networking opportunities for Power Partner members. "As a journalist, I cannot overemphasize the importance of having a resource like you available to make fast, useful connections with potential sources. I will be hitting you for more help in the future!" "Power Partners has introduced me to clients I would have never connected with on my own. The business gained through Power Partners has dwarfed the initial investment to join and the connections made will pay dividends for years to come. We're always looking to make new connections and meet business owners in differing fields. Power Partners has provided the unique service of making the initial introductions and pairing us up with other businesses that we can have synergistic relationships with. Alan is always there to answer any and all questions...even on weekends. I've been more than pleased about my experiences with Alan and am proud to be a Power Partner!" 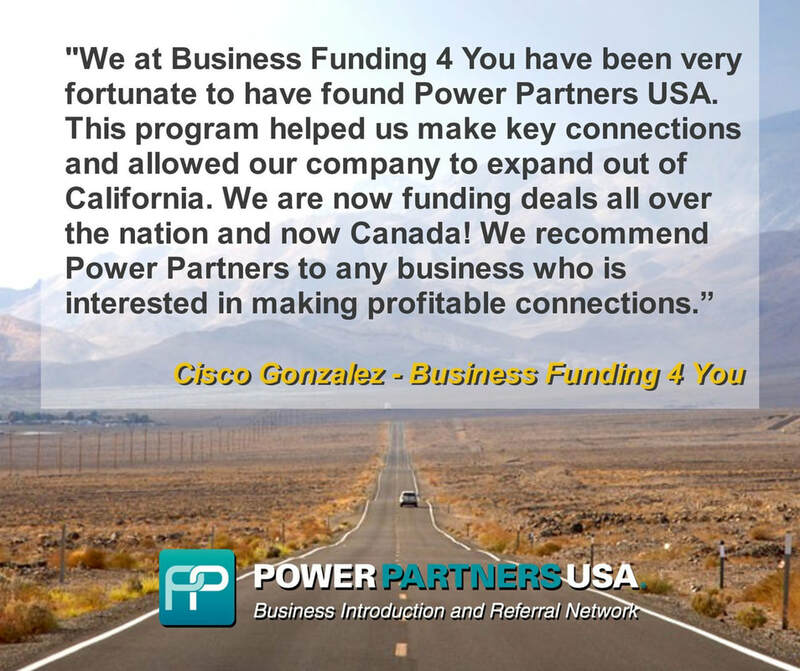 "Power Partners USA has been very instrumental in finding me new partners and sources that give me repeat business. My Power Partner USA video has helped explain my business to prospects and professionals who can use my services. Alan from Power Partners USA has also referred me direct business within and outside of the Power Partner USA network." I have been working with Alan Armijo for many years, and have a been a client of Power Partners USA, since its inception. I am a sole practitioner, business attorney in the Long Beach, California area, and Power Partners USA (and Alan Armijo before that) has been instrumental in orchestrating my marketing and networking program. Power Partners USA has successfully connected me with professionals in other businesses, who share the same type of clientele. In my case, Power Partners USA has sifted through its membership profiles, and connected me with professionals in the fields of accounting, business banking and insurance, who work closely with small businesses. By turning my social media marketing and professional networking efforts over to Alan, I have saved a great deal of time, and increased my networking success. I highly recommend Power Partners USA to any professional looking to connect with the right people, to create mutually beneficial business referral relationships. Game designers, marketing strategists, concept artists, programmers, visual effects artists and composers. Play Interactive video on the left to hear Paul's testimonial.